Here is the layout of Ayla's cave as described in the second book of the Earth's Children's series. The Valley of Horses. Cave mouth facing the southwest around 6.5-7 feet high. The walls angled back from the entrance, widening until they came to a fairly straight back wall. The general shape was roughly triangular. Near the dark corner, Low opening a small recess with sloping roof meeting floor in the back forming a small nitch. 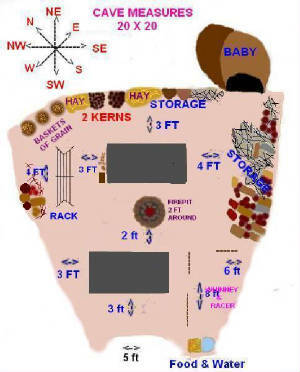 In the dark corner farthest from the entrance baskets and bark containers of dried meat, fruits and vegetables, seeds, nuts, grains, piles of ground roots and fruits. Rear wall were stacks of wood, dried horse dung and mounds of dry grass. Baskets of grain, for Whinney, were stashed in the opposite corner. Past Ayla's bed and personal belongings along the wall near it, herbs, roots, and barks suspended from a rack. Sunk the posts for it in the packed earth of the cave not too far from the fireplace. On the other side of the herb rack was an assortment of various materials: chunks of wood, sticks and branches, grasses and barks, hides, several rocks and stones, basket of sand, chunks of wood, small & large hip & shoulder bones. The horse's sleeping place against the wall on the opposite side of the cave mouth.